You can edit tabulated results of an attribute query set using the Return Attribute Set option with the tools shown in the following table. This utility is especially useful for editing existing events together in a single table that is physically modeled in separate event tables or feature classes. For more information, see Selecting an attribute set as results. When the Return Attribute Set option is selected, the table returns results of the attribute set query. The results are modeled as separate event layers. Clear all the event highlights on the map. Highlight all the selected events. Zoom to highlighted events on the map. Zoom to selected events on the map. Bulk edit a field's value. Export the selected records to a CSV file. Sort the results table using advanced options. 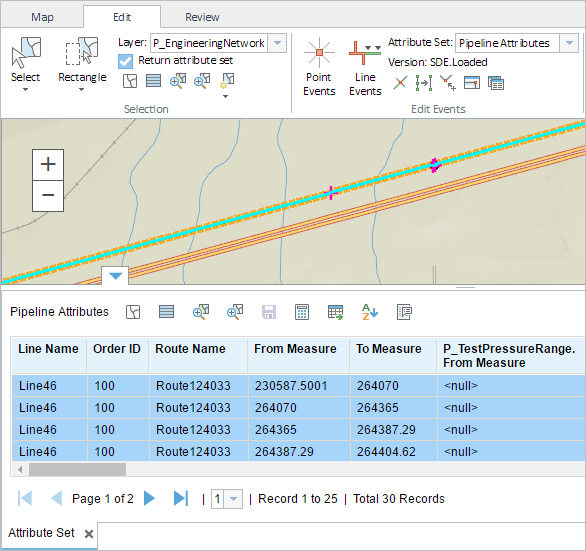 Configure measure length and navigation to highlighted results. In cases where events are being modified on a route and you want to see the previous events on the route at that location, don't use the Add Linear Event widget. Instead, edit events in the Event Selection table or the Attribute Set table. If this method is used, you can see what was previously on the routes at the specified measures. This experience supports editing events from multiple event tables or feature classes that are dynamically segmented together. Double-click a cell in the table to allow the value to be edited, and change the value. If the cell is gray, the cell can't be edited. If the cell is white, the cell is editable. A yellow-colored cell shows that it has been edited but the edits are not saved. Coded value and range domains are supported when configured for any field in the attribute set table. Click Save to make the changes to the cells in the table permanent. A Save Options dialog box appears. If the edits are for error correction or a similar workflow, the event record does not need to be retired and time sliced since the changes are correcting a mistake. In this case, the Retire edited events and create new events effective from the selected date check box should be left unchecked. If the edits to event records represent changes to the events at a certain time (such as a speed limit changing from 50 to 55 on 09/22/2014), the Retire edited events and create new events effective check box should be checked for the date the old event should be retired and the new event should begin. If multiple events that are edited are coincident in measure and attributes, and you want to combine them into a single event record, check the Merge coincident events that are edited check box. Any coincident events that are edited will be merged. To keep events coincident in measure and attributes as different event records, do not check the Merge coincident events that are edited check box. A confirmation message appears at the lower right once the edited event is saved. A new event record is created if the original value in the cell was null. The existing event record is lengthened or shortened if the value edited is the same value as another record coincident in measure with the same attributes. The existing record is split if the value is edited in a cell and the cell does not represent the measure for the entire record in the database. If a new record is created, the start date of that record is the retired date selected in the Retire edited events and create new events effective option from the selected date; otherwise it is the start date of the route. If two or more event records are merged, any one of the EventID is used when the Merge coincident events that are edited option is checked but the Retire edited events and create new events effective option is not checked. No one has a lock on the event layers in the attribute set for the route on which the events are located. You already have one or more event locks in the current version on the event layers in the attribute set for the route on which the events are located. You already have a lock in the current version on the route in which the attribute set table is being edited. You already have a lock on the concurrent route of another network in the same version in which you're currently working. You can edit events in the attribute set if other events along the same route have locks acquired by different persons in different versions. Some or all of the event layers present in the attribute set are already locked by another person for the route on which the event is located. Some or all of the event layers present in the attribute set are already locked in a different version by you for the route on which the event is located. The route on which the event is located is already locked by another person. The route on which the event is located is already locked by you but in a different version. The concurrent route on another network is already locked by you in another version or by a different person in a different version.